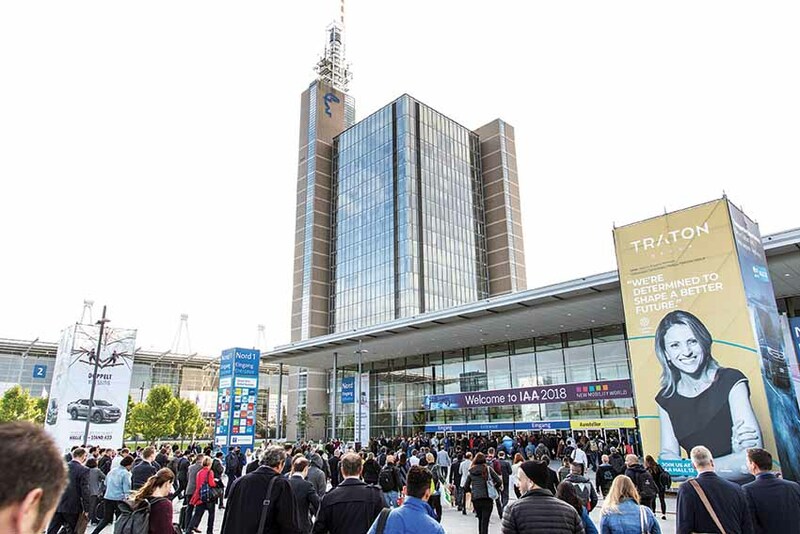 The 67th IAA Commercial Vehicles show at Hannover, Germany, lived up its aspiration of being an important event for transporters, logistics players, those involved in the mobility space. 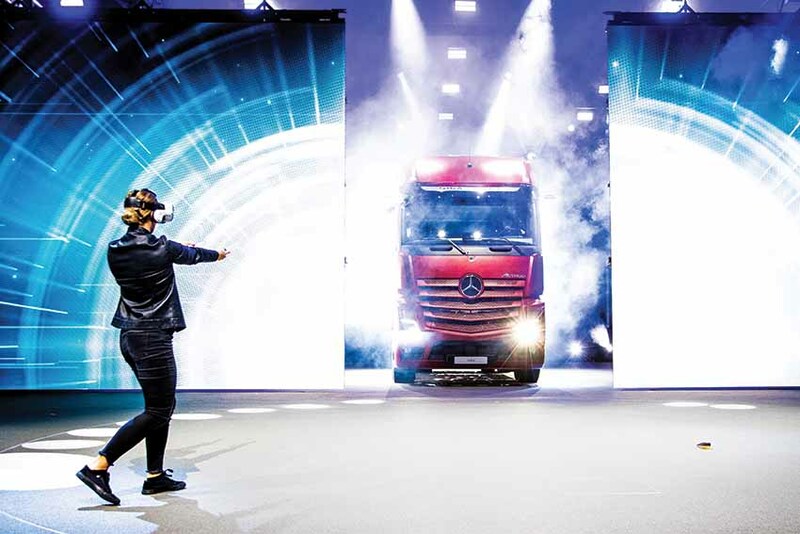 Held under the theme, ‘Driving tomorrow’, the 67th IAA Commercial Vehicles show at Hanover lived up to the aspiration of being the world’s most important trade fair for transport, logistics and mobility. Reflecting the significant change in the transport, logistics and mobility space, the show, organised by the German Association of the Automotive Industry (VDA), attracted 2,174 exhibitors from 48 countries. Marking a considerable rise in participation over the 2016 edition, the 2018 edition was spread over an area of 282,000 sq. m. Conveying a message of electromobility, the expo hosted 435 world premieres, roughly 31 per cent more than the 2016 edition. A biennial show that attracted a high number visitors, and despite the inclement weather (it were hot during the first few days, and rainy and stormy in the later days), the 67th IAA Commercial Vehicles show, for the first time, has cargo ebikes on the stands. They are looked upon as a provider of a smart, environmentally friendly and affordable solution for last mile transportation. The innovation trend of digitisation was also quite evident at the expo with producers of trucks and buses, trailers and various other systems highlighting the same. Almost all – large, medium-sized and smaller suppliers were found to highlight the development of digital technologies. At the forefront especially were the telematics providers in good numbers. Positioning itself as a marketplace for experts in the commercial vehicle sector, the proportion of trade visitors was well over 80 per cent, many of the decision-makers. 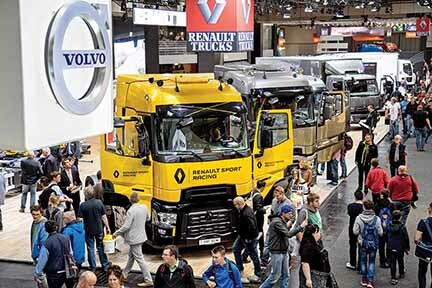 The 67th IAA Commercial Vehicles show played an effective platform for a good number of purchasing agreements. One logistics company, according to industry sources, bought 2,500 trucks from three manufacturers. Yet another company, said sources, bought 1,000 trailers! Offering a platform for the automotive industry and new target groups like technology firms, mobility providers, startups and digital businesses to meet one another, the show also witnesses the coming together of high-ranking representatives from politics, academia and society for discussions of the future of mobility. The show also turned out to be an effective platform for presenting of innovations, and to make the mobility of tomorrow something that can be experienced. 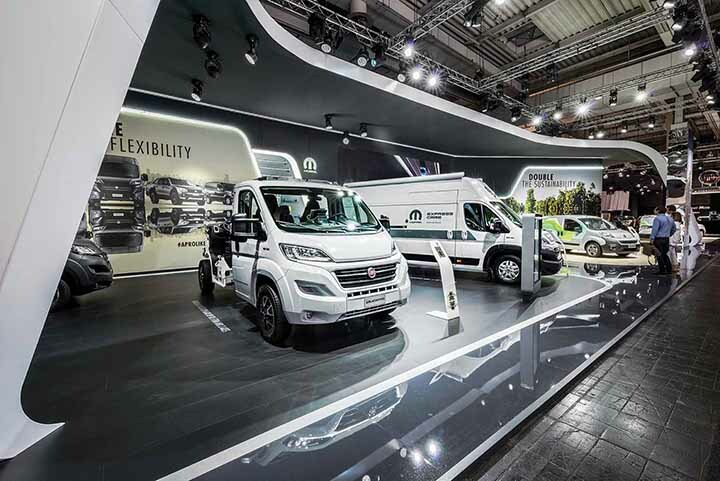 Under the motto ‘Simplifying Business’, MAN Truck & Bus AG unveiled the MAN eTGE, a battery-electric version of the new MAN van, and a fully electric distribution truck, the MAN eTGM. 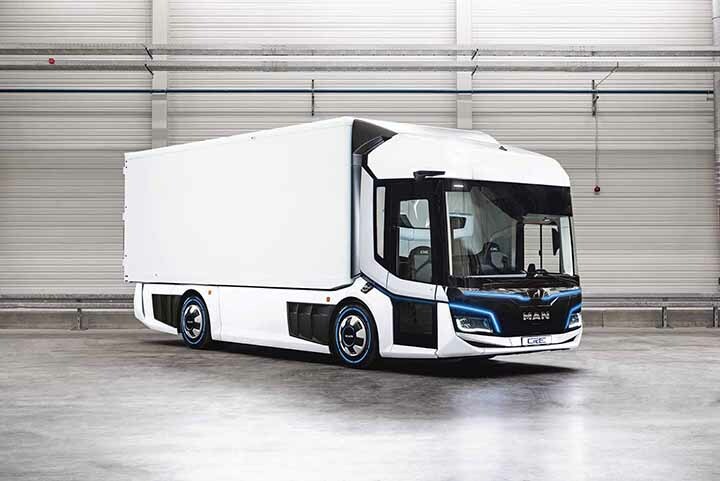 One of the first manufacturers to present fully electric solutions for the entire field of city logistics between 3.5 and 26-tonnes, MAN premiered a concept etruck called the CitE. Full of new ideas and creative solutions, the 15-tonne CitE took 10 months to develop. Presenting an uncompromising design for inner city distribution transport, the concept etruck has an unusually low entry height and wide doors. The co-driver’s door opens at the press of a button. The cockpit is ergonomically perfect and presents the driver an excellent panoramic view due to a low seat position and large side windows. Employing a 360-degree camera system to provide the greatest possible level of safety and to eliminate dangerous blind spots, the CitE has a range of 100 kilometres. Forming development partnerships with locations including Munich, Hamburg, Wolfsburg and Luxembourg to allow daily experiences to be incorporated into series development, MAN unveiled a close-to-series prototype of the MAN Lion’s City E. The ebus is driven by a central motor on the driven axle, which clears good amount of space for optimised seating area at the rear. Four additional seats could be had thus. The batteries of the ebus are crash-proof. Located on the roof to save space, they allow for a range of up to 270 kms, and can be charged in just three hours. Transforming itself to become a supplier of intelligent and sustainable transport solutions, MAN is offering its customers digital solutions under the name, ‘MAN DigitalServices’. It is working on a digital technology initiative that will allow MAN customers to receive real-time and location-independent insights into vehicle data and analyses derived from it. Entering the van business last year, MAN showcased the eTGE 4.140 full electric concept with a range of around 160 kms and a payload of one to 1.75-tonnes depending on type approval. The eTGE is powered by electrical components that have already proven successful in mass production. The 36 kWh battery loses 15 per cent of its capacity after around 2,000 charging cycles with appropriate care. Individual modules consisting of six or twelve cells can also be replaced separately. The 264 lithium-ion HV cells are stored underneath the slightly raised load floor, which is constructed in the same way in the rear-wheel-drive body version with a diesel engine. A permanently activated synchronous motor is used for the drive system. The three-phase motor is mounted right at the front; on the drive axle in combination with a single-speed gearbox. This provides a maximum of 100 kW of power. Around 50 kW is delivered in continuous operation. 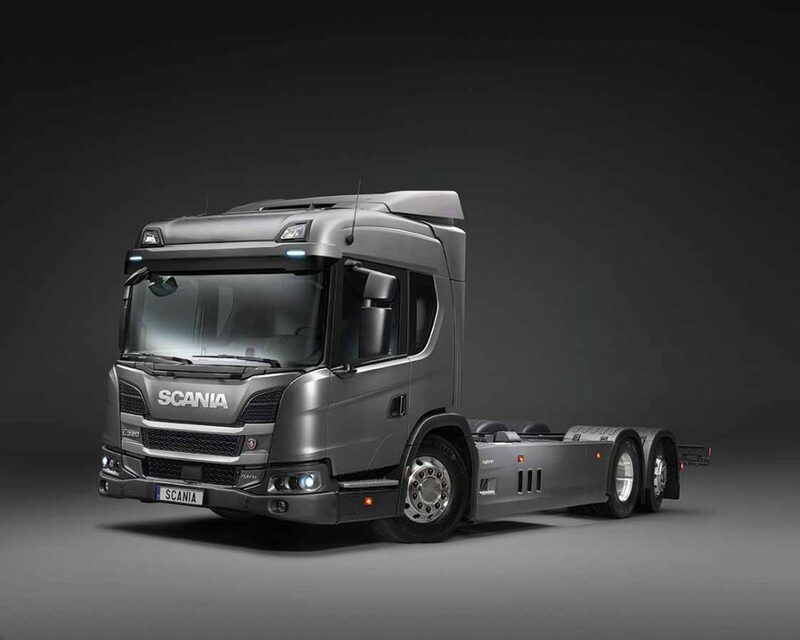 Scania unveiled a plug-in hybrid electric truck (PHEV) based on its new generation truck platform. The PHEV and its sibling, Hybrid Electric Vehicle (HEV) truck are set to be introduced in the short-term, and could use Scania Zone, a new service to assist transport companies and their drivers to adhere to local regulations by linking policies such as speed limits, emission restrictions and noise limitations to geo-fencing zones in Scania Fleet Management to facilitate seamless compliance with emissions and speed regulations in certain zones. The PHEV and HEV are powered by Scania’s DC09 in-line five-cylinder engine that can run on HVO (Hydro treated Vegetable Oil) or diesel, working in parallel with an electric motor generating 177 hp and 1,050 Nm. The lithium-ion rechargeable battery’s energy window is set to 7.4 kWh to secure a long battery life. The trucks can be driven in fully electric mode without any support from the combustion engine, thanks to electric auxiliaries for steering and brake air supply. 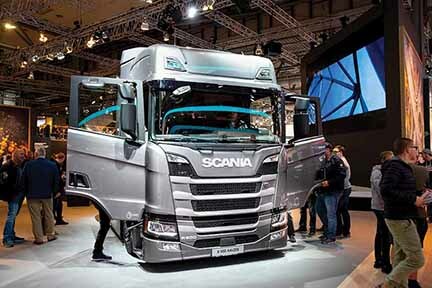 Apart from an LNG powered truck, Scania displayed the flagship R and S-Series trucks. On display was a 450 hp 8×4 truck from the versatile XT range, tailored for construction tasks; the L-series from the newly-launched urban range, with unmatched visibility for challenging city traffic; the CrewCab fire truck; and a forestry truck. Scania premiered an interlink medium decker coach for Liquefied Natural Gas (LNG) operations for a range of up to 1,000 kms. With LNG becoming increasingly available in Europe, the Scania interlink medium decker coach is aimed at inter-city operations with a potential to reduce CO2 emissions by 20 per cent. Capable of also substantially reducing nitrogen oxide and particulate matter emissions, the bus adds to Scania’s alternate fuel bus and coach line-up, which comprises of the Scania Citywide LE Suburban hybrid and the Scania Interlink High Decker powered by HVO. 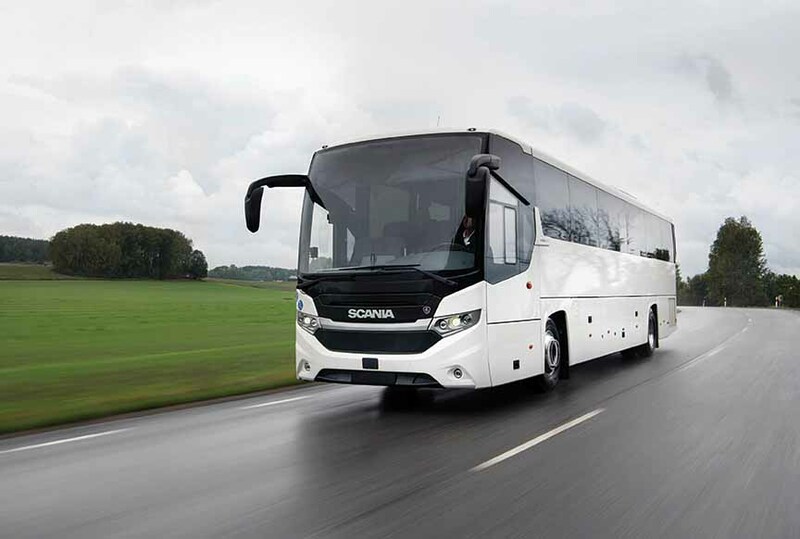 Scania also showcased its battery-electric Citywide low-floor bus, which is presently found on routes in the Swedish city of Östersund. Mercedes-Benz Actros 1863 Edition 1, LS 4×2, Exterieur, High-Tech silber metallic, L-Fahrerhaus, SoloStar Concept, GigaSpace, OM 473 Euro VI mit 460 kW (625 PS), 15,6 L Hubraum, 12-Gang Mercedes PowerShift 3, Active Brake Assist 5, Abstandshalte-Assistent, Verkehrszeichen-Assistent, Spurhalte-Assistent, Stabilitätsregel-Assistent, Aufmerksamkeits-Assistent, Active Drive Assist, MirrorCam, Multimedia Cockpit interactive, Predictive Powertrain Control mit Erweiterung um Interurban, BiXenon-Scheinwerfer, Driving Package, Comfort Package, Media Package, Stowage Package, Sight Package, Extra Line. Mercedes-Benz Actros 1863 Edition 1, LS 4×2, Exterior,High-Tech silver metallic, L-Cab, SoloStar Concept, GigaSpace, OM 473 Euro VI rated at 460 kW/625 hp, displacement 15.6 l, 12-speed Mercedes PowerShift transmission 3, Active Brake Assist 5, Proximity Assist, Traffic-Sign-Recognation-Assist, Lane Keeping Assist, Stability Assist, Attention Assist, Active Drive Assist, MirrorCam, Multimedia Cockpit interactive, Predictive Powertrain Control with extension Interurban, BiXenon headlamps, Driving Package, Comfort Package, Media Package, Stowage Package, Sight Package, Extra Line. Showcasing about 70 vehicles, Daimler also held an experience event at Hanover Airport for journalists on the sidelines of IAA 2018. The highlight was the unveiling of the new Actros truck with trailblazing innovations that immediately pay for themselves. 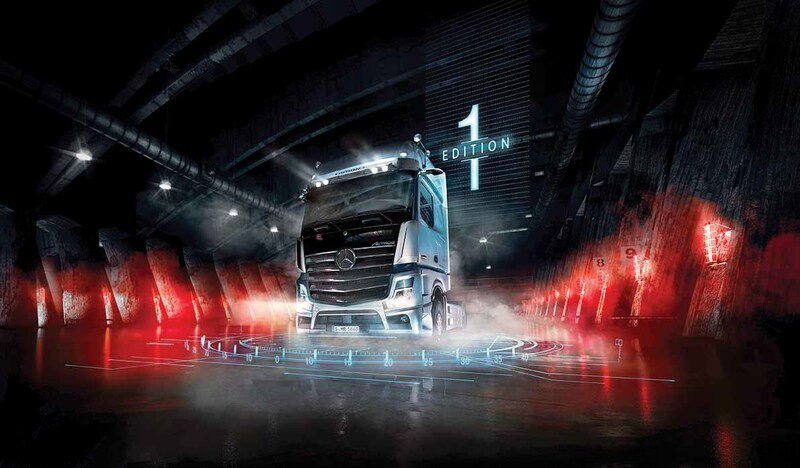 A special edition of the new Actros, the ‘Edition 1’, will amount to 400 numbers only and comes with numerous extras that offer maximum comfort and safety to the driver. Incorporating selected design features that give the vehicle a high recognition factor, the Edition 1 features MirrorCam and Active Brake Assist 5. The Active Drive Assist makes semi-automated driving possible. The improved Predictive Powertrain Control not only allows significant fuel savings, it relieves the driver of some of the workload on overland routes. As in the standard model, the new, intuitively controlled multimedia cockpit brings innovative functionalities into the cab. Offering optional features like four additional LED long-range headlamps and an exclusive paint finish on the maintenance flap and front-end flap, the Edition 1 comes with an illuminated Mercedes-Benz star with a black facing and six decorative mesh inserts with a darkened headlamp surround for higher recognition. 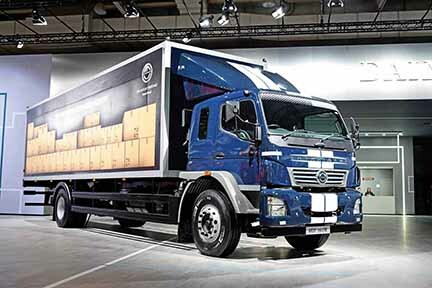 The Edition 1 is said to reflect on the leading position of the new Actros, which is available in two and three-axle models with GigaSpace and BigSpace cab, in left and right-hand drive. The more conventional eActros includes eleven battery packs inside and below the chassis, with a usable total capacity of 240 kWh. The drive comes from electric motors close to the wheel hubs with a maximum output of 2×126 kW. The additional weight of approximately 2.5-tonnes compared with the conventional drive is partly offset by the increase in the permissible gross vehicle weight in the EU of one-tonne for trucks with alternative drive systems. The range of the eActros is around 200 kms. Die Jury „Bus of the Year“, internationale Fachjournalisten aus 22 Ländern, hat den Mercedes-Benz Citaro hybrid zum Bus of the Year 2019 gewählt. Das Fahrzeug überzeugte bei dem Vergleichstest in den Kategorien Wirtschaft¬lichkeit, Innovation, Qualität und Anwenderfreundlichkeit. 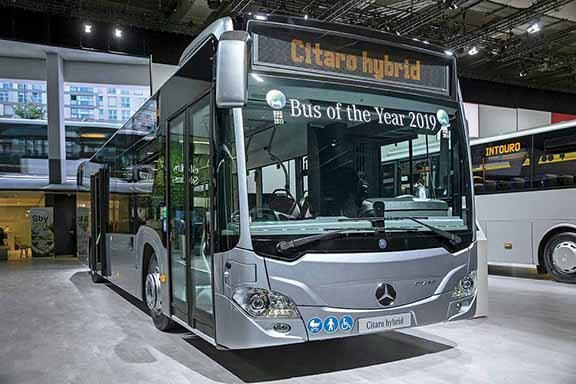 The Bus of the Year jury, international trade journalists from 22 countries, voted the Mercedes-Benz Citaro hybrid Bus of the Year 2019. The vehicle scored well in the comparative test in the categories for economy, innovation, quality and user-friendliness. 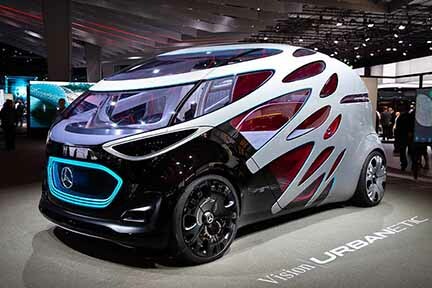 In the van space, Daimler unveiled a Mercedes-Benz Vision ‘Urbanetic’ concept. It is revolutionary in the way it goes beyond existing autonomous vehicle ideas. Eliminating the separation between the movement of people and goods, the concept van reduces traffic flows, relieves city-centre infrastructures and contributes to a new quality of urban life. Set to become a reality in the not too distant future, the concept, developed in close association with BASF, is based on an autonomous, electrically powered driving platform embedded in a self-learning IT infrastructure. As a ridesharing vehicle, Vision Urbanetic can carry up to twelve passengers (the cargo module can accommodate up to ten EPAL palettes). Offering a load length of 3.7 m in an overall vehicle length of 5.14 m, the concept also incorporates an IT infrastructure that analyses supply and demand within a defined mobility space. Announcing that it would invest in US-based Proterra Inc., which is a leader in North America for electric buses for local transport, Daimler unveiled a new, all-electric Mercedes-Benz eCitaro city bus with innovative thermal management, a battery capacity of 243 kWh and seating space for up to 88 passengers. Expected to completely replace the combustion engine with unique battery technology and fuel cells as a range extender, the city bus is an integral part of the emobility system at Daimler Buses, which supports transport operators with everything from in-depth advice, an intelligent charging management system and the training of their employees through to the provision of specific services. The Bus of the Year jury consisting of international trade journalists from 22 countries, voted the Mercedes-Benz Citaro hybrid bus as the ‘Bus of the Year 2019’. Albeit away from the Daimler main product lines was the BharatBenz MDT 1617R displayed with a parcel body. 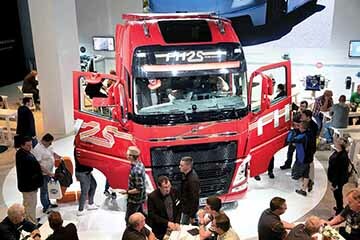 Celebrating the 25th anniversary of the Volvo FH model, Volvo Trucks showcased a gas-powered FH Series truck that emits 20 per cent less than a conventional FH. The LNG-powered truck is claimed to provide the same performance and operating range as its diesel equivalent. The Swedish CV major also displayed the FE and FL Electric, which will go on sale in Europe next year. The FL and FE Electric are designed to take up to 27-tonnes, and can drive nearly 125 miles on a single charge. The FE Electric has two motors that come with a maximum power of 370 kW, and a Volvo two-speed transmission. The energy storage is through lithium-ion batteries, which can hold 200-300 kWh. 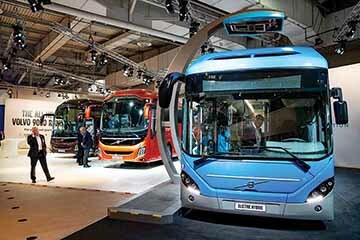 The technology is shared with Volvo’s line of electric buses, where more than 4,000 units have been sold to date. Volvo Truck is betting on electric trucks with a belief that they will pave the way for more sustainable freight movement within urban boundaries. For duties like municipal waste removal, for example. Volvo used the show as a platform to highlight its driverless electric concept Vera. A unique concept that could radically change the whole perception of transport, the Vera combines electromobility, connectivity, and is autonomous. Suitable for regular and repetitive goods transport over short distances, the Vera has a fifth wheel coupling but no cab. Volvo Buses unveiled an all-new platform for tourist and line-haul coaches. The platform includes the luxurious Volvo 9900 and the versatile Volvo 9700. Both feature a dynamically designed exterior with crisp lines, smooth sides and rounded corners to give low air resistance. The new ‘Z-shaped’ side window line along with the sloping theatre floor of the 9900 marks a new design language for coaches. The 9900 offers an extra-high floor level and large glass panels for exceptionally good views. The interior roof is eight-cm higher. The 9700 is available with a wide variety of equipment alternatives for medium range line-haul or premium tour and charter operations. Providing passengers a high-quality travel experience Volvo, the 9700 comfortable and pleasant. The lower centre of gravity makes driving the buses easier. The bus displays high stability and manoeuvrability. If the Volvo dynamic steering contributes, the 9700 and 9900 feature a comprehensive suite of solutions for active and passive safety, including more robust front impact protection (FIP) and a Driver Alert system that monitors the vehicle’s movements and issues alerts if the driver is tired or not concentrating on the road. Volvo Buses also displayed the 7900 Electric Hybrid (plug-in hybrid) and an OppCharge station for quick-charging of the vehicle’s battery pack. 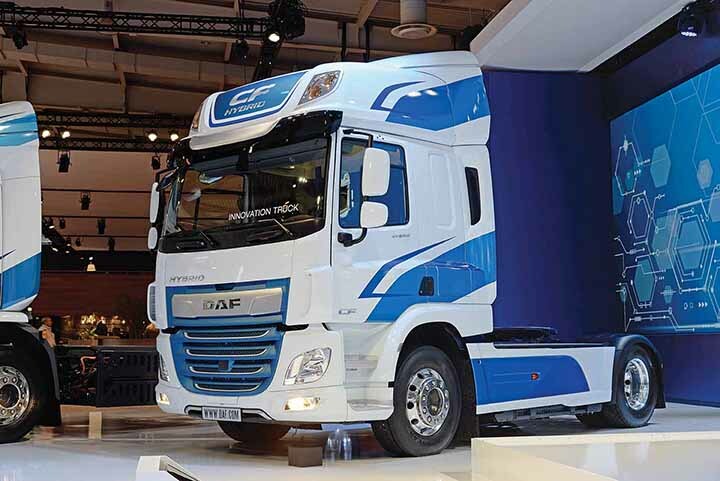 DAF Trucks showcased its capability to innovate, and in the process highlighted its 90 year history. The CV maker displayed the classic DAF A1600 from 1967 through to the future DAF CF Electric Innovation truck. While the latest offerings, LF, CF and XF, took centre stage, the DAF CF Electric 4×2 tractor attracted the most attention. Developed for up to 40-tonne GCW distribution applications within urban areas, the vehicle uses VDL’s advanced E-Power Technology for fully electric operation. The center of the intelligent powertrain is the 210 kW electric motor that draws energy from a 170 kWh lithium-ion battery pack and provides a range of approximately 100 kms. The batteries can be fast charged in 30 minutes. A full recharge would take no more than 1.5 hours. The first set of these ‘Innovation’ trucks is set to go into field test application this year. Another attention grabber was the DAF XF 90th Anniversary Edition. The truck features a premium options package, exclusive striping and exterior design elements. It is powered by a 530 hp PACCAR MX-13 engine. Displaying DAF’s famous historic logo on the front, sides and back of the cab, the truck is offered with a luxurious, fully leather upholstered interior. The display of new 100 per cent electric Z.E. range put the spotlight on electric mobility at Renault. 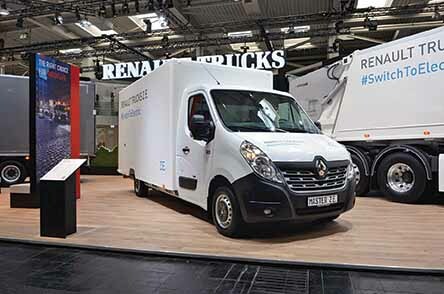 Displaying a Master Z.E, and a D Wide Z.E., fitted with a refuse collector body, Renault Trucks, which recently announced the launch of its second generation of 100 per cent electric vehicles (trucks) designed for urban use, showcased the latest limited edition, namely the T High Renault Sport Racing. The truck would be launched later this year. The Master Z.E. is an entry-level electric van with 3.1-tonnes GVW. It is fitted with a 57 kW motor that produces a peak torque of 225 Nm. Having 33 kWh lithium-ion batteries, the van can do a maximum speed of 100 kmph, and has a range of about 120 kms. 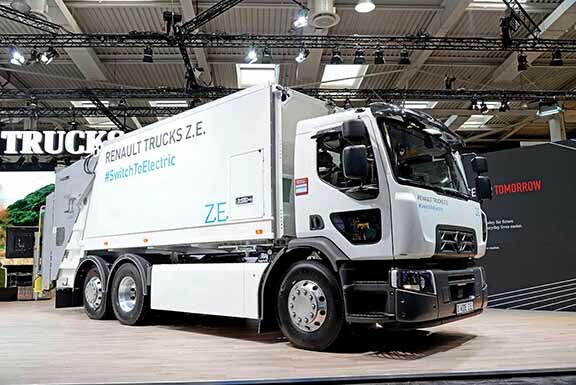 Apart from Master Z.E electric, D Wide Z.E and the T High, Renault Trucks displayed the D 14 fitted with a 240 hp 5-litre Euro6 (xTL compatible) engine; a T High 520, 4×2 tractor; T High 520 Maxispace 4×2 tractor fitted with a 13-litre Euro6 engine; T 460 Sleeper Cab 6×2 carrier fitted with an 11-litre Euro6 engine, and a C 480 Optitrack+ 4×2 fitted with a 13-litre Euro 6 engine. The French CV maker also unveiled details of its FALCON (Flexible & Aerodynamic Truck for Low CONsumption) research project. Demonstrating multi-functional transport solutions for various types of business, industry, passenger transportation, vehicles for business and travel in extreme road conditions, GAZ showcased GAZelle Next Euro6 light commercial vehicle, Sadko Next off-road truck, Ural 6×4 road truck, YMZ-534 Euro6 engine and the ‘GAZ Connect’ digital telematics platform that allows monitoring of over 50 different parameters of vehicle systems, and tracking of vehicle location in real time. The ‘GAZ Connect’ also offers over 100 online services through mobile application or website. Displaying the 25-seater Vector Next bus with a Euro6 170 hp engine, and a low-floor LiAZ-5292 bus with 101 passenger capacity for urban transit operations, with a 260-312 hp YMZ 536 gas six-cylinder engine, GAZ also showcased the Gazelle Next range of light-duty trucks and vans. The Ural Next range proved to be the highlight. Named after the famous Ural mountains in Russia, the Ural Next trucks are found in the form of a 16-tonne dump truck, 16-tonne bulk cargo truck, and a tanker for transportation and short-term storage of food and liquids among others. The range also comprises of a 19-tonne special application truck, which is aimed at construction, road, farming and other industries. Found in the form of a defense application truck for carriage of troops and materials, and a tractor-trailer for diverse applications with a GVW of up to 62-tonnes, the Ural Next trucks are dandy machines with all-wheel drive. Offering a good combination of dynamics and towing performance, the trucks feature a cab that can seat three, and is ergonomically modern. The cab-behind-engine design ensures convenient access to the engine, a necessity when working in extreme climate conditions. Could be had with the second row of seats, which increases total seating capacity up to seven, the tractor cab in the Ural Next range is of the sleeper variety. At its booth at the IAA 2016 MAN presented busses of both brands, MAN and NEOPLAN. Neoplan, in association with MAN, showcased a 78-seat Neoplan Skyliner with a redesigned D26 engine that now delivers 510 hp and a maximum torque of 2,600 Nm. Employing the latest generation TipMatic Coach Automated Gear Shift (AMT), the Skyliner coach, to prevent blind spot-related accidents, is equipped with a new mirror system. The same system is also found on the Cityliner. Cameras on both sides of the vehicle deliver real-time images on two displays built into the driver’s field of view. At a glance, the driver can see what’s happening without the need for rear, wide-angle and ramp mirrors. The camera technology supports a high-resolution display of the surrounding area irrespective of daylight. The driver has an improved view at night and in changing light conditions. Limiting factors such as misting up, dirt accumulation or sun glare is minimised. The ‘bird view’ system of the Cityliner has six cameras. The cameras provide views of the vehicle’s surroundings, which are seen on a separate monitor on the driver’s console. The Cityliner L has a modified interior that accommodates up to 35 passengers. In addition to a VIP lounge, it has a kitchen with a convection oven, induction charging for mobile telephones and ambient lighting. The Tourliner C that Neoplan displayed marks the entry point to the Neoplan range. The third vehicle in the movingART project, the two-axle vehicle carries a prominent Berlin adhesive tape livery and incorporates four-star seating. Capable of seating 48 passengers, the coach is powered by a performance intensive 470 hp engine, which is mated to a new MAN TipMatic Coach gearbox. Presenting solutions for mobility, Volkswagen displayed a Cargo e-Bike, a three-wheel cargo pedelec for last mile transportation that can carry up to 210 kg (including the driver) with a cargo volume of one and a half cubic metre. 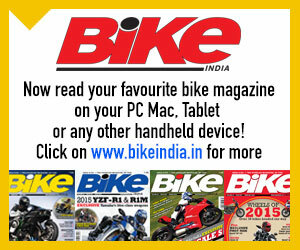 The e-Bike is powered by a 250-watt mid-mounted motor with an automatic gearbox. It has a small turning circle and innovative tilt-compensating technology which always keeps the load platform horizontal. The ABT e-Caddy and the ABT e-Transporter are solutions that are aimed at urban transportation. They follow e-Crafter retrofit solutions that have been prepared for small vans and city delivery vehicles. The I.D. Buzz Cargo concept van leverages IoT, and has onboard an ‘electrified’ shelving system that was developed for service installers and maintenance technicians to offer connectivity with a functional control unit for the user. The Crafter HyMotion concept van Volkswagen displayed is based on the e-Crafter. It is an electrically powered 3.5-tonne van and powered by a fuel cell. Its 4.2-kg hydrogen tank (modular design) enables a total range of 350 km. Another version of the vehicle is also available, albeit with larger tanks for driving ranges of up to 500 km. TRATON AG, formerly known as Volkswagen Truck & Bus AG, presented innovative drive and battery technologies for electric commercial vehicles, as well as a new modular configuration for virtually all platforms. The e-Delivery truck concept the company showcased has a range of up to 200 kms, and employs lithium-ion-nickel-manganese-cobalt cell (NMC) battery banks. Having a quick-charging mode which reaches 30 per cent capacity in 15 minutes and 100 per cent in three hours, the e-Delivery, thanks to the new powertrain, achieves an output of up to 260 kW with a maximum torque of 2150 Nm. 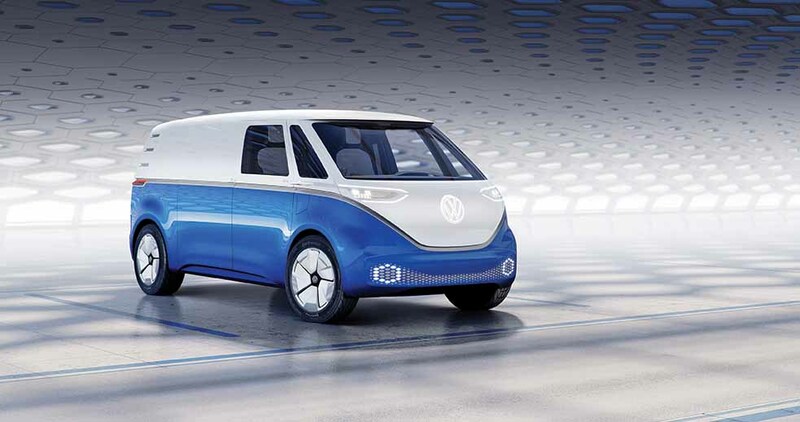 Divided into three parts, a front module with the cabin and additional functions, a middle module with the batteries, and the rear module with the powertrain, the e-Delivery truck concept makes flexible assembly possible and provides more space for batteries. Engineered such that the various components and designs can be easily combined for other electric vehicles as well, the e-Delivery truck concept is equipped with pneumatic suspension and a smart payload reading system, which synchronizes the load and electricity consumption in the eco-drive mode. The braking system has three regeneration stages and enables the capture of up to 30 per cent of power during braking. The Volkswagen Caminhões e Ônibus showcased a Volksbus e-Flex concept with a flexible architecture for electrification. The concept bus is engineered to work as a battery electric; as a hybrid electric; as a plug-in hybrid, and as a range-extended electric. Offering the same performance, regardless of how the batteries are charged, the e-Flex concept has a generator driven by a Volkswagen 1.4 TSI Flex engine. The generator and engine set starts automatically by means of intelligent vehicle electronics as soon as the pre-programmed battery charging level is detected. The e-Flex technology reduces the need for charging infrastructure, which will accelerate the acceptance of electric vehicles. Entering into a strategic partnership with TRATON AG, Hino displayed the Poncho EV, a small electric low-floor bus. Measuring seven-meter, the Poncho EV is equipped with a 30 kWh battery pack. With three examples in circulation (two in Tokyo and one in Ishikawa) as of now, the small electric low-floor bus has covered close to 400,000 kms over the last six years. 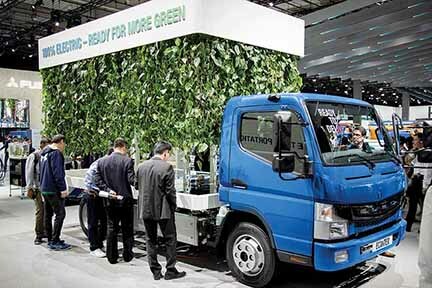 Mitsubishi Fuso, a Daimler Group company, showcased an all-electric light-duty Fuso eCanter. It is in use at various customers in North America, Europe and Asia. Equipped with six 82.5 kWh batteries, the etruck has a travel range of more than 100 kms. It is powered by a 129 kW motor, and engineered to do duty in urban delivery areas. The eCanter has 3.5-tonne GVW. Produced in Tramagal, Portugal, and available in approximately 30 markets in Europe, Amercias, and Asia, the eCanter is produced at the Mitsubishi Fuso plant at Kawasaki, Japan, for the Japanese market. Apart from the eCanter, Mitsubishi Fuso also showcased the E-Fuso Vision One concept. 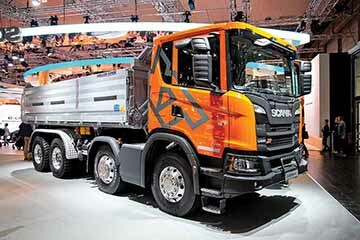 It is an all-electric heavy-duty truck concept with three-axles and has the capability to achieve a range of up to 350 kms. The battery capacity is 300 kWh. Pointing at a separate brand positioning for electric vehicles, the company, through the concept etruck, endorsed its commitment to electric technology. Turkey-based BMC Automotive Industry Trading Inc. showcased the new generation Tugra truck. It would be available with a wide variety of models with different cabs, FPT and Cummins engines, and ZF gearboxes. 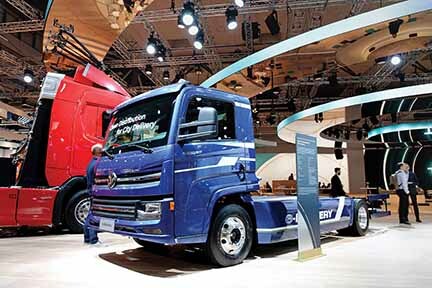 Debuting in several versions including a 4×2 tractor for long-distance routes, as well as 4×2, 6×4 and 8×4 chassis, the Tugra truck range marks a flagship offering. 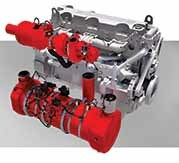 The flagship tractor is equipped with an 11-litre German FPT Cursor engine rated at 460 hp and a peak torque of 2150 Nm. The engine is mated to a 12-speed automatic transmission from ZF. The front axle is from Ege Endustri whereas the rear axle is from Meritor. The standard equipment includes ABS, ESC, lane keeping control system and an emergency braking assistance system. Available with a Cummins diesel engine in a 290-400 hp power range as well, the Tugra has replaced the BMC Professional family. The design of the Professional range was by Pininfarina. The BMC Tugra is an independent development of the Turkish company with key design elements like a locomotive inspired cabin with a wide grille. Highly recognisable, the Tugra cab is designed such that it could be used with a minimal rework for a wide range of vehicles including versions with a sleeping compartment or a day cab. The cab includes a modern dashboard with a seven-inch touchscreen and an LCV readout in the instrument panel. Isuzu showcased the Novociti Life Premium, Visigo and Citiport bus versions. 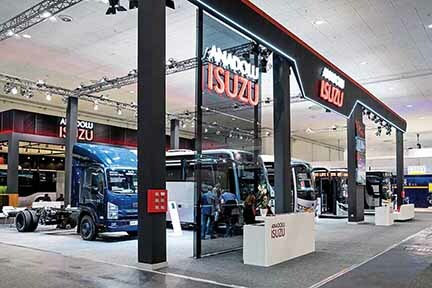 Developed by Isuzu engineers, the buses are said to combine the latest technologies in the commercial vehicle industry. The new Citiport 12 HyPer bus the company displayed, is powered by a 340 hp engine and measures 18 m in length. The Isuzu Novociti Life Premium is built using high-quality equipment whereas the Visigo, introduced in a new Hyper version, is powered by a 320 hp 6.7-litre engine. The Turquoise model, at the other end, is a midi-bus. It features a VIP package, with a 2+1 seat configuration, and amenities like a toilet beside additional comfort equipment. Ford Otosan unveiled a new tractor F-MAX, which marks an important addition to the range of trucks the company offers. Aiming at a presence in 51 markets, the company announced that the F-MAX benefits from Ford’s principles of comfort, power, efficiency, and technology. Equipped with a 2.5 m long cabin, the F-MAX is claimed to offer superior efficiency and practicality. Featuring an all-new aerodynamic design, with 2160 mm floor to ceiling height and 260 mm of seat adjustment, that offers the driver a bit more space than usual, the F-MAX cab has storage space that is modelled like the ones in aeroplanes. The upper bed is 90-degree foldable. Powered by a 500 PS engine that was designed and tested by 500 Ford Otosan engineers over five years, and across 11 countries using 233 prototype units, the F-MAX was awarded the International Truck of the Year 2019. The F-Vision Future Truck Ford Otosan showcased is a fully electrically-powered concept truck with level-four automation. The first concept truck from the company, the F-Vision reflected on the company’s vision as far as electric, autonomous, connected, lightweight and zero-emission trucks are concerned. Caring about human priorities both inside the cab and on the road, the F-Vision is about load carriage. 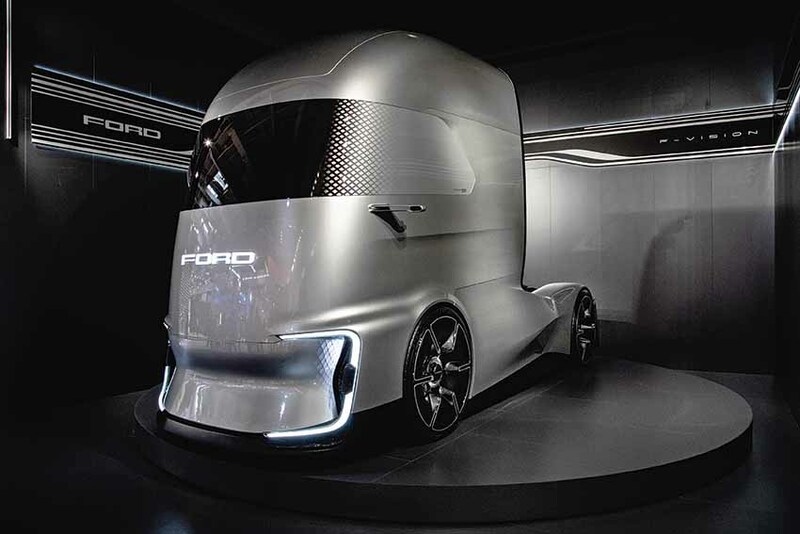 The etruck concept, with 400 kW, aims to connect with the environment and users according to Ford Otosan sources. 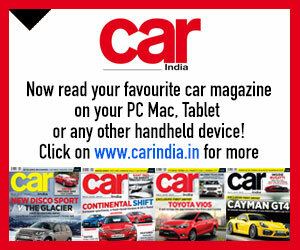 Fuel consumption is optimised by six-per cent in comparison to the previous models. 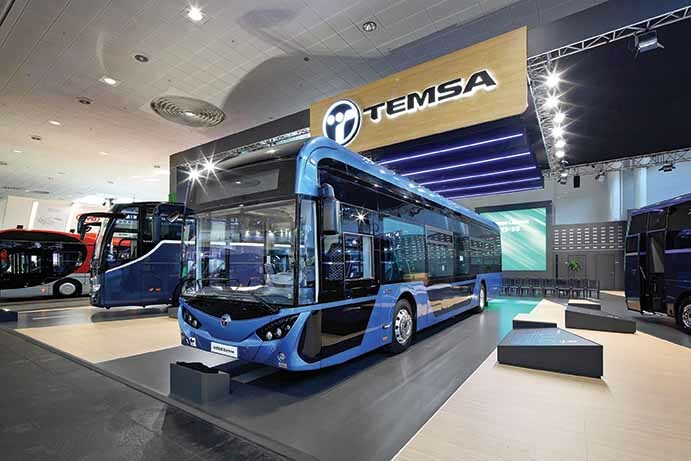 Temsa presented the Avenue Electron, an electric bus whose serial production has begun, together with Maraton and MD9 vehicles. Catering to over 66 markets around the world, the coachbuilder has designed and engineered the Avenue Electron for future smart mobility applications. Measuring 12 m in length, the ebus is equipped with TM4’s SUMO electric powertrain that comprises of a high-torque direct drive motor and automotive-grade power electronics. With a range of 400 km on a single charge, the Avenue Electron is scheduled to start production in 2019. Capable of carrying up to 80 passengers, the ebus is powered by a 320 kWh battery pack and can travel up to 400 km on a single charge. 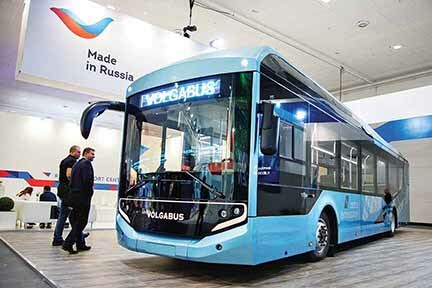 Volgabus displayed its first electric bus, the CR12E (short for CityRythm), which it has created for the European market. Developed to include the latest technical standards with composite material and lightweight alloys for the side panels and roof, the ebus weighs 30 per cent less. Made from a steel structure welded by robots to ensure high quality, including the paint job, the CR12E has a 300 km range, and can be fully charged in five hours, which avoids installing expensive infrastructure. 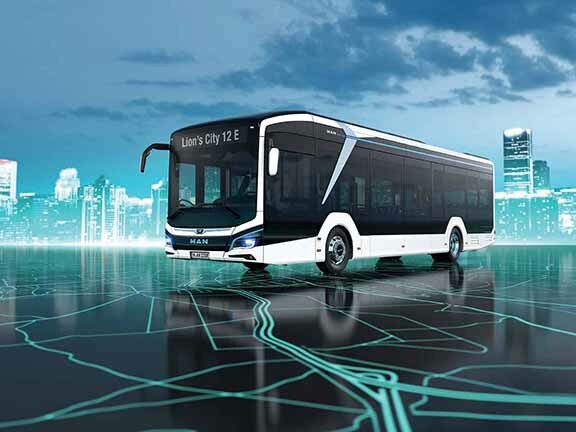 Laced with electronic braking system that supports the regeneration of energy lost in braking otherwise, the ebus is equipped with an air brake system. Using a ZF AV 130 axle with two 125 kW engines integrated into the wheelhubs, the CR12E comes with a host of electrically driven systems like electric power steering, electric door drives, and an electric heating pump instead of a traditional climate system. Power consumption is said to be 0.8 kWh per km. Energy comes from a 300 kW LiFePO4 battery. The front part of the bus is a low floor with enough space for bikes and wheelchairs, which can enter the bus via a folding ramp. The CR12E can carry up to 85 people (26 seated). 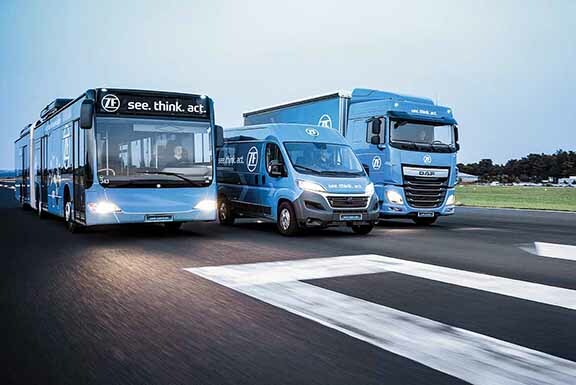 Presenting a 100 per cent diesel free stand, Iveco displayed 18 vehicles showcasing its sustainable solutions that range from electric city buses to long-haul LNG trucks. Apart from a CNG/LNG filling station in association with Shell, the Italian CV major showcased a zero-emissions Daily Electric Minibus as part of the Daily Blue Power sustainable family that was crowned ‘International Van of the Year 2018’. The Daily Electric Minibus offers a perfect solution for last mile, stop-and-go city application. The Heuliez Bus GX ELEC fully electric city bus features the most advanced battery technology. The new generation Crealis In-Motion-Charging bus, at the other end, combines electric overhead lines with on-board battery energy storage that enables in-motion charging. 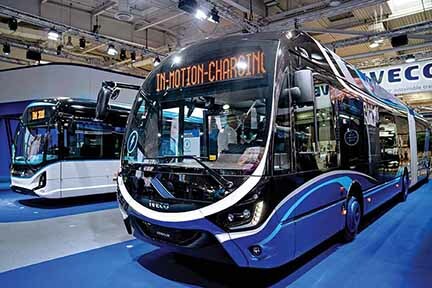 For suburban public transport, Iveco displayed the CNG powered BUS Crossway Low Entry Natural Power. With the tanks integrated into the roof space, the bus offers a range of 600 km. The Daily Natural Power van displayed by Iveco is equipped with Hi-Matic eight-speed auto transmission mated to a 3.0-litre CNG engine. Apart from a 7-tonne chassis cab equipped with Junge platform and curtainsider, Iveco showcased a chassis cab equipped by Fassi with a Maxicargo tipper trailer and crane for Ville de Paris. To commemorate the Daily’s anniversary, the Italian major displayed a van equipped with a Kerstner deep cooling fridge in the 40th Anniversary Limited Edition livery, and a van equipped for parcel deliveries by Spier with a personalisation designed by Garage Italia Custom. To highlight its preference for CNG, the company displayed two Eurocargo (for municipal applications) with a three-way tipper by Meiller, and a sweeper body developed by Johnston Engineering. Highlighting its association with Carrier Transicold, Iveco displayed a brand new 26-tonne 400 hp Stralis NP rigid equipped with a Frappa body and featuring Carrier Supra CNG technology. The reefer truck is 100 per cent natural gas powered. 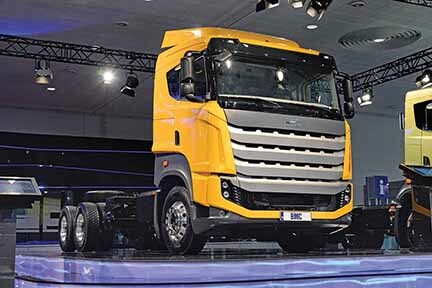 For long-distance missions, Iveco showcased a natural gas-powered Stralis NP. The Stralis NP 460 the CV maker displayed, was elected Low Carbon Truck of the Year in the UK last year. A unique 400 hp Stralis X-Way Natural Power equipped with a CIFA electric concrete mixer grabbed attention. The truck runs on bio-CNG, and is equipped with the Energy hybrid plug-in concrete mixer developed by CIFA. The mixer is operated by an electric engine powered by a lithium battery and features a Kinetic Energy Recovery System that recovers the truck’s energy when it is decelerating. The other Stralis NP Iveco displayed, was the 460 hp LNG truck for swap body missions; a 6×2 LNG tractor with 750 km range; a 4×2 LNG tractor with 1,600 km range, and a low tractor in LNG version with 1,150 km range. Fiat Professional exhibited eight vehicles representing its wide, well-structured range, which covers every working mission. The star of the Fiat Professional stand was the fascinating Fullback Cross Concept by Garage Italia, an original concept vehicle created in partnership with Lapo Elkann’s creative hub. It featured a distinctive Green and Bronze two-tone livery, bronze mirror caps, 17-inch black matt wheels, and an ‘Elmo Vintage’ brown leather interior. A pick-up truck with a strong lifestyle personality, the Fullback Cross concept is claimed to have a best-in-class turning circle diameter. Parking is simplified by the rearview camera, and comfort is guaranteed by the leather seats and automatic transmission. Just a touch of a button switches from two-wheel drive mode, ideal for fuel-saving, to all-wheel drive with a Torsen central differential for off-road use. The Fullback Cross also offers the option of low-range gears and, for the most extreme terrains, mechanical locking of the rear differential. The Talento Shuttle customised by the German firm Irmscher, offers vast flexibility for exclusive airport car-park or hotel shuttle services. The special Talento that Fiat Professional displayed, can carry up to six people, including the driver, and has a high-class interior with attention to every detail so that every occupant has the greatest travelling pleasure. 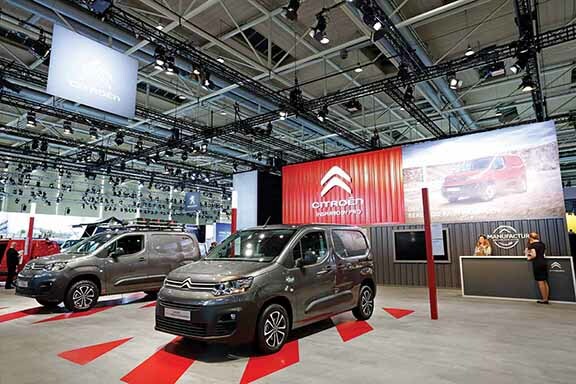 Citroën premiered four vans – the Berlingo Transline Solution, the Berlingo Chimney Sweep Solution, the Berlingo Service and the Berlingo Rehab. 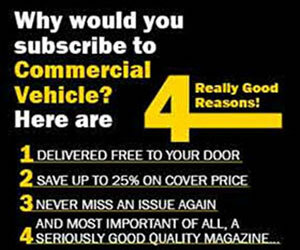 The four vans are industry-specific custom solutions and demonstrate the various expansion and modification options for the latest member of the Citroën transporter family. The Berlingo Transline Solution marks a professional load securing concept from Würth, and is a genuine all-rounder for tradespeople. The Citroën Berlingo Chimney Sweep Solution was developed in close collaboration with the chimney sweep trade by the company Bott, and offers an attractive solution for everyday use. The Citroën Berlingo Service, with vehicle equipment from Würth and four-wheel drive from Dangel, marks a suitable solution for the forestry sector and outdoor activities. The Citroën Berlingo Rehab, created in collaboration with AMF-Bruns on the basis of the Berlingo passenger car, marks a vehicle for disabled passengers. Depending on the use, it could be had with four seats and a wheelchair space, or with five seats. Launched in 2018, the Berlingo van platform from Citroen marks the third generation of the van. A perfect fit for the widely varying requirements of commercial customers, the Berlingo van architecture is available in two different lengths (M and XL) and offers a large loading space, easy access and a versatile interior. The van promises superior agility, comfort and safety over the previous model, and is powered by a Euro6d-TEMP 120 hp engine. Under the ‘Smart Logistics’ theme, ZF displayed technologies that will support the future of CVs, aid automation and make a case for efficient last mile transportation. An interesting case in point was the Innovation Van with a high-speed ZF ProAI supercomputer, sensors, camera, radar and lidar. An all-electric with level-four autonomy, the van is designed to independently manoeuvre through city centers, stay in its lane even without road markings, recognise both traffic lights and road signs and react to sudden hazardous situations. In addition, the Innovation Van can detect and drive around obstacles such as double-parked vehicles. The FollowMe function utilises a tablet-based remote control and is engineered to be of particular help to the drivers. In case the two addresses are close enough and call the driver to reach the next on foot, the Innovation Van will follow him. If there is no parking available, the driver could send the vehicle to the next stop where it looked for a parking space on its own. Displaying Innovation Truck and the Terminal Yard Tractor, ZF highlighted the work it has done to respond to key freight challenges. The two vehicles can autonomously manoeuvre, swap bodies, trailers and containers. The driverless vehicle is manoeuvrable and is laced with functions that improve efficiency, speed and environmental-friendliness at depots, company terminal yards and container ports. 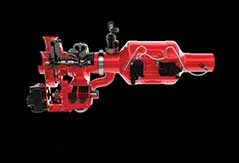 They are also capable of reducing accidents and property damage. To address the rising demand for electric propulsion in CVs, ZF announced that it has received a volume-production order for its new CeTrax electric central drive. An electric axle drive system for light commercial vehicles will go into volume production in mid-2019, said company sources. 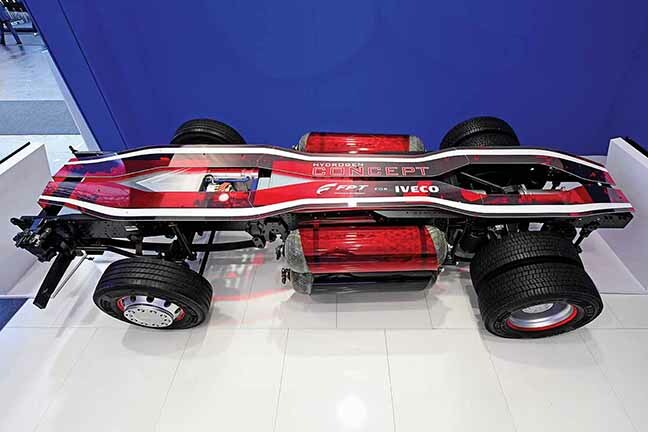 FPT Industrial showcased a hydrogen fuel cell powertrain concept as part of a strategy to provide a wide range of power sources. The company is working on the development of hydrogen fuel cell technology to arrive at a new zero-emissions transport solution for heavy-duty vehicles. It is confident that this technology could be used in CVs to deliver zero tank-to-wheel and well-to-wheel emissions. It could also play a significant role in the development of a virtuous cycle such that hydrogen would be produced locally through renewable energy sources such as bio-methane, wind or solar energy. FPT is exploring the possibilities of using hydrogen as a zero-emissions fuel alternative for long-haul transport with the level of performance that is no less than conventional heavy-duty solutions currently available. It is also looking at combining it with autonomy without sacrificing efficiency and reliability that the sector demands. The concept the company showcased features a carbon fibre, high-resistance fuel tank. Hydrogen flows directly into the fuel cells to generate enough electricity to power a 400 kW engine. Cummins Inc. presented innovations to achieve a low Nitrogen Oxides (NOx) emissions future. It displayed a concept emissions control system capable of minimising emissions to levels previously thought unfeasible, including a possible next level of Euro VII regulations. Combining next-generation technology with the latest smart digital technologies to drive diesel engine evolution, Cummins highlighted the use of enhanced design tools and advanced materials like composites to reduce component weight and enhance vehicle productivity. 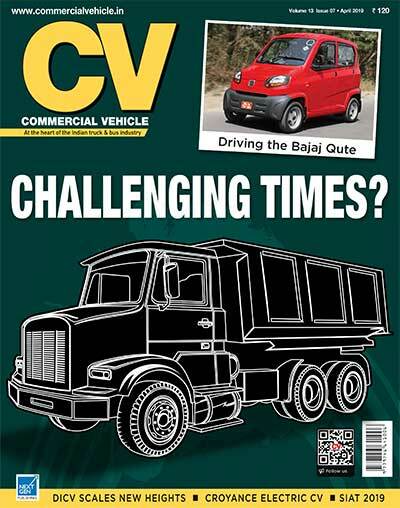 With most CV industry stakeholders stressing on a diesel-free CV environment, Cummins, through technical advancements, seemed to send a message that diesel is continuing as a primary source of power in CVs for the foreseeable future yet. The company showcased a smart connected suite of wireless monitoring, reporting, calibrating and servicing applications to help boost vehicle uptime and reduce the total cost of ownership. The advanced suite of plug-in hybrid electric powertrain solutions complements PowerDrive, an advanced suite of plug-in hybrid electric powertrain solutions spanning light, medium and heavy-duty applications. A Kenworth T370 US Class-six truck took centre stage as an electric hybrid utility truck. The truck is powered by a Cummins B6.7 engine paired with a Cummins PowerDrive 6000. The Cummins PowerDrive offers both parallel and series capabilities and could replace conventional transmission and switches in real time between two-hybrid, and two pure electric modes in a bid to optimise the powertrain for the best fuel economy in any driving situation. Also configured with exportable grid quality electric power to recharge vehicles and a recovery crane operating on either electric or engine power take-off, the Cummins PowerDrive system with a flexible architecture, claimed sources, have travelled more than six million miles in a fleet setting in the United States and China. A US Class-six truck powered by the PowerDrive with a 50-mile (80 km) electric range, claimed sources, realised reduced emissions by up to 80 per cent in comparison to a conventional vehicle in the same class. The truck demonstrated a reduction in fuel costs by between 40 to 80 per cent, subject to the drive cycle. Brakes India showcased an entire range of pneumatic and hydraulic brake systems, hydraulic clutch products and machined iron castings. The display of the pneumatic foundation brake system included air actuated disc brakes and ‘S’-cam drum brakes said to service wheel rim sizes from 16-inch dia. to 25 inch dia. From seven-tonne vehicles to 49-tonne vehicles, the hydraulic braking systems included hydraulic disc and drum brakes, vacuum boosters, hydraulic uniboosters and hydraulic Anti-lock Braking Systems (ABS) for CVs in the range of four- to 11-tonne GVW. The company also showcased its clutch range comprising of the concentric slave cylinder, plastic master cylinder and a pneumatic clutch booster. 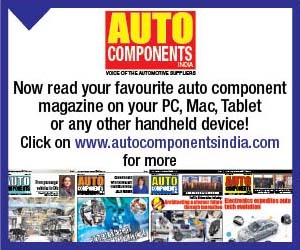 Displaying brake system parts like pedal box assembly, hydraulic brake hose assemblies, transmission parking brake and castings for chassis and engine applications, Brakes India displayed some products made under a technology license from ZF and Meritor. 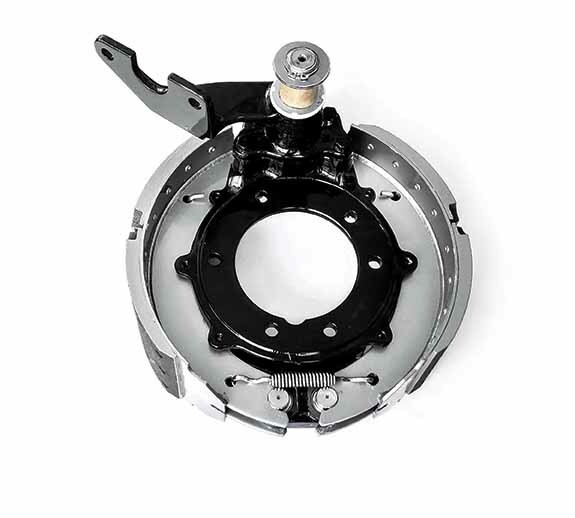 Interestingly, Brakes India also supports technology partner Meritor by manufacturing air disc brake assemblies and sub-assemblies for the global market.